Organic Salmon - Is There Such a Thing as Certified Organic Farmed Salmon? Is "Organic Salmon" a Certified Sham? We've all heard that fish is a healthful food and that we should eat more of it. Given that one can only eat so many fish sticks and tuna melts before the desire for a real meal kicks in, the rising popularity of salmon over the past few years has been no surprise. 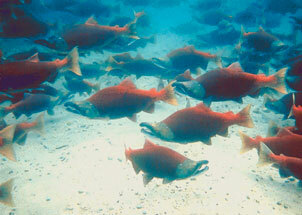 The coincident increase in salmon availability due to fish farming has stoked the frenzied salmon feasting. But then the brouhaha over PCBs and other contaminants in farm-raised salmon hit, as well as concerns over environmental problems associated with salmon farms, and consumers were left flopping about like hungry fish out of water, wondering whether to continue eating salmon or not. Thus, it was just a matter of time before some enterprising fish farmer came up with "organic salmon." That's great, because organic is good, right? Well, grab your cup of grog and pull up a stool, me maties, and I'll tell you the tale of the Wild-Eyed Salmon Farmers and the Organic Standard. the processing plants and handlers between the farm and the consumer must be certified as well. chemicals would not be used to clean contaminants off the organic farmed salmon's net pens. Note all those uses of the word "would"! That's because the USDA organic standard does not apply to fish. The producers of so-called organic salmon know that the USDA organic standard does not apply to fish, so they've been smart enough to use a generic "organic" label, as opposed to the official USDA organic label. OK, so these producers don't really even have the option of using the official USDA organic label, so as long as they follow the general guidelines for raising organic animals, it's still a good thing, right? Well, yes, IF that's what they're actually doing. But if they're not following the rigorous methods that would be required by organic standards as they would be applied to farmed salmon, then not only are the organic-salmon purveyors tricking consumers into thinking they're getting something they're not, they are also tarnishing organic labeling in general. Some of the growers that are calling their salmon organic are indeed doing some of the things that would be required if an organic certification program were in place, but of the two examples cited in a recent San Francisco Chronicle story, neither operation would likely qualify as organic using their current techniques. Still, to be fair, their operations do appear to be cleaner, more sustainable, and less chemical-intensive than conventional salmon farms. "[Sold] locally in some Whole Foods Markets [in the San Francisco area] is the Black Pearl Natural Choice brand. This Atlantic salmon is raised on feed that's certified organic in Britain in lower-density pens off Scotland's Shetland Islands, and sold through Boston-based Martin International. Whole Foods doesn't call it organic, but clerks can tell customers about the fish's cleaner pedigree." Note that the Scottish salmon in this case is NOT being labeled organic by Whole Foods. In a related and seemingly contradictory story, the UK Observer points out that there are high levels of cancer-causing dioxins and PCBs in organically raised Scottish salmon because the feed used in the farms is heavily contaminated due to the fact that it's made of meal fish caught in the polluted North Sea. The story also points out that "carnivorous aquaculture" is inherently unsustainable because the amount of feed required is emptying the oceans of many species of small fish. At some point, USDA, international government agencies, and organic organizations will likely extend the organic standards for land-based livestock to fish. That would be a good thing—the more certified organic food, the better—as long as it's done right. However, one Alaska senator—the same one that years ago proposed a multi-billion-dollar federal project to "harness the energy of the aurora borealis"—has proposed that wild salmon be automatically considered organic. On its surface, that idea certainly seems less goofy that the Big Battery in the Sky project, but as we documented above, there's much more to certifying something organic than just making sure it doesn't include chemicals, synthetic hormones, or genetic modifications. Wild salmon, though they are an excellent dining choice, are unlikely to ever qualify for the organic label because they are not raised in a controlled, certifiable environment. However, future organic certification for farmed salmon and other farmed fish is likely. The Organic Trade Association points out that the Soil Association, a leading organic standards organization in Great Britain, has given limited organic certification to one fish farming operation that is a land-locked closed system, within which the fish swim freely. At this point, claims of "organic" on packages of salmon or other fish carry far less weight than such claims on land-based foods and should be treated with suspicion. Salmon labeled organic may or may not be better than conventional farmed salmon, and in almost all cases is unlikely to have been raised in a truly organic manner. Unfortunately, USDA claims that the lack of coverage for fish under the organic standard leaves them with no authority to tell the marketers of "organic salmon" to knock it off. That's a disappointingly timid response to the problem, but about what we've come to expect from USDA. For now, it's buyer beware, and we are left only with those two scary Latin words, "caveat emptor." Long live the emptor! Is Farmed Salmon Really Unsafe Because of PCBs and Other Contaminants? "Salmon farming—the placement of large metal or mesh net cages in the ocean to grow fish—was pioneered in Norway in the 1960s. Since then, the industry has expanded to Scotland, Ireland, Canada, the US, and Chile, but is dominated by the same multinational corporations. Wherever it is practiced, net-cage salmon farming is controversial and raises serious environmental concerns"